Enjoy Cape Cod and our Fisherman's Fillets in your home. in your home and stay Heart Healthy! We all know Cape Cod has the greatest beaches in the northeast and Chris and I enjoy them when we are not working! However, what the cape is really known for is being the best vacation spot in the entire North East. But what if you are on a special heart-healthy diet? Well, there are a plethora of restaurants that serve up some great fresh fish. Some are "quick-stop" outside venues and others with water views and indoor seating. And if you prefer to cook the fish yourself, fish can be purchased cleaned and filleted almost right off the boat from one of the local markets or restaurants! But, Cape cod is not why we assembled this recipe page, although we will bring you some fun links. It is for our Cape-Cod Fisherman's Fillets. Checking the sun set during the incoming tide on Cape Cod Bay. Now dig deep..... if you were born before 1988, you might have seen this recipe in a specialty salad cook book. But age does not matter, because the recipe still stands on it's own, even as Chris and I had fun preparing this by changing and mixing things up a bit. We recommend you use the type of fresh vegetables your taste buds crave. Of course season with salt and pepper as you see fit. In this recipe, we use Vidalia onions and a dark green Bell pepper, but if all you have is Spanish onions or another variety that adds more punch, go ahead. Have fun with it! You should be able to taste the flavor of each ingredient without an after taste and when the fish begins to flake apart, it is done. Mix it up a bit, but the main thing is these Cod fillets are just what the doctor ordered! Prepare rice in large pan with hot water. Cook until done then drain. In a large skillet, heat dressing, pepper, onion until onion sweats (becomes translucent). Add the fresh Cod fillets and the diced tomato. Simmer covered until the fish flakes. Remove from heat. Place a cup of rice on plate. Spoon fish and vegetables onto plate. Use Salt & Pepper sparingly. 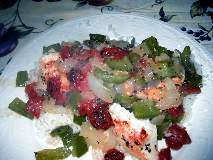 So, you came to this page in search of Cape Cod information but got a great fish recipe. We are expanding this page with content about places to eat and beaches to go to from the towns we feel are family friendly or just great places to visit for a summer vacation. But! And there always is another but..... Our priority will be with adding neat food links as well as fun places to take the kids. The town of Dennis has a beach area that really is "kid friendly." And our first stop on the eating extravaganza is the Dog House. This restaurant is an open air beach style restaurant that has the best hot dogs we have ever enjoyed on Cape Cod. While the town of Dennis has a kid friendly beach area, the town of Yarmouth, with Route 28 running right through it is the center of "kid friendly" kids of all ages! But what if you are at or near retirement age, or are thinking of moving to Cape Cod, are young at heart, enjoy Nantucket sound, want to be in the center of the peninsula but not in the maddening crowd? Yarmouth pretty much offers you those features whether it be in Yarmouth Port, South Yarmouth, or West Yarmouth. Yarmouth is the town to be in! As we are experiencing it, Yarmouth is the perfect place to be because it is in the center of Cape Cod and within a short drive to Provincetown or Plymouth. Yarmouth businesses are all within a short ride and when it comes to sidestepping traffic, Yarmouth has a road structure that is conducive to avoiding the increased summer visitor traffic on Route 28. But that is a secret for those who love Yarmouth. There are six beaches in South Yarmouth. Four of those beaches adorn West Yarmouth on Nantucket Sound. One beach in Yarmouthport, Grays Beach is by far one of the most photographed beaches as it has a long boardwalk that culminates in a seating area facing west. More sunsets are viewed on that boardwalk and Cape Cod bay has been photographed by millions of people over the years. Bass River Beach and Seagull Beach are the largest and offer the best of Nantucket Sound. Both areas offer facilities for spending long hours on the beach. Bass River offers boat launching and has a fishing pier and jetty. While Seagull beach offers up a huge white sandy beach and rock jetty as well, it has the most beach front. Both beaches offer food and changing facilities. In between there are 4 other smaller beaches each with different facilities from picnic tables to rest facilities. Want a grand view of the Hyannis Harbor boat activity? Bayview beach is the place to be. A small beach area with bench seats offers you a place to just cool off and watch the boats and sunsets. Yarmouth is close to education (Cape Cod Community College), the YMCA, Equestrian Centers, the Arts. And it is full of history and culture. There is the Cultural Center of Cape Cod that offers events and exhibits, Classes and Workshops such as Arts Day Camps for kids. It is located on the east side of Bass River adjacent to the bridge and boat docks. If you have a volunteering side, a Habitat for Humanity office is in town. In addition, the Cape Cod Center for the Arts is always looking for volunteers. If you golf, Yarmouth has the Bayberry Golf course with a challenging set of holes for your short game as well as your long game. Yarmouth real estate has the best access to salt water beaches, fresh water ponds, fabulous golfing and fishing and great recreation areas for all ages. The Winslow Crocker House, located on route 6a in Yarmouth is a fabulous historical place to visit and is free to Yarmouth residents. Then there is the Taylor-Bray farm in Yarmouthport is open year round and offers seasonal farm events. If you enjoy literature (especially Childrens Books), there is the Edward Gorey House. Within it, the house displays the talents and his distinct personality traits of a unique author. Of course, there is the Judah Baker Windmill located on Bass River. It originated in South Dennis but was eventually moved to its current location and offers Yarmouth residents and the public a close-up experience in the construction of early windmills. Bring your beach chairs as there is a small beach area overlooking the Bass River into Dennis. It has a history of milling grain and where it sits is also a park which includes a small swimming beach on Bass River. If you have ever driven down Route 28 toward Dennis you have seen the Baxter Grist Mill. The first mill in Yarmouth was built around 1700. Originally located near Swan Pond it served as a fulling mill. Thomas Baxter and Shubal Gorham built the grist mill for grinding corn. Over the years, it transitioned from an outside waterwheel to an interior power turbine. The mill operated for around 200 years until the advent of electricity. But Yarmouth also has some fabulous restaurants, both kid friendly and adult friendly. One of our favorites for breakfast is the Route 28 Restaurant. A diner type front, its owners serve up breakfast and lunch. You might want to get there early as it gets crowded quickly. Don't let that deter you from going. The friendly staff will get you seated as quickly as possible and your food will be hot when set in front of you at your table. While not in Yarmouth, the Sea Street Cafe in Hyannis is the place to go and have breakfast all day. The portions are full and the taste is excellent. Don't worry, they also serve a great lunch as well. All the food is prepared for you as if you were at home. The wait staff is friendly and attentive. Parking can get tight, so pack the car with people. Travel to downtown Hyannis (Main Street) and look for Sea Street. Take the left and look past the traffic light. You can't miss it. Yes, there are a plethora of things to do in Hyannis and walking down main street you can catch a ride on the Duck boats, which is loads of fun for the whole family, but there is also the Hyannis harbor where you can catch the ferry to Martha's Vineyard and Nantucket. Thanks for stopping by and if you are on Cape Cod now, hope you are having a wonderful visit.